Here you'll find everything you need to know about how a paycheck advance works. We'll explain what it is, how you qualify, and what the lender matching process entails. A paycheck advance is a short-term loan for a relatively small amount of money designed to help you cover emergency expenses between paydays. 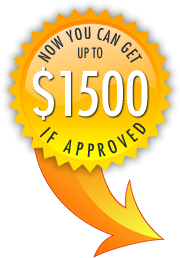 Also called a payday loan, a paycheck advance allows you to get your payday early so you can make ends meet. Your paycheck advance can be automatically deposited to your checking or savings account, if approved. Payment options may vary depending on your lender. Sign Up. You fill out our free lender matching form. The form is free and secure. Approval decision. Our lenders will let you know whether or not you qualify as soon as possible. Funds deposited. If approved, your designated lender will automatically deposit your funds into your checking or savings account by the next possible business day. Repayment. Please speak to your designated lender for any repayment options and questions. For the answers to some of the most commonly asked questions about paycheck advances, see our FAQ page.